Bubble wrap packaging keeps items safe while in transit. Use bubble wrap packaging to safely transport items. Use Anti Static bubble wrap to protect electrical componants. 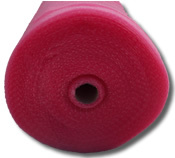 Large Bubbles for extra protection 300 mm (12") wide x 45 metres (49 Yards) long. 750 mm (30") wide x 45 metres long with large bubbles.